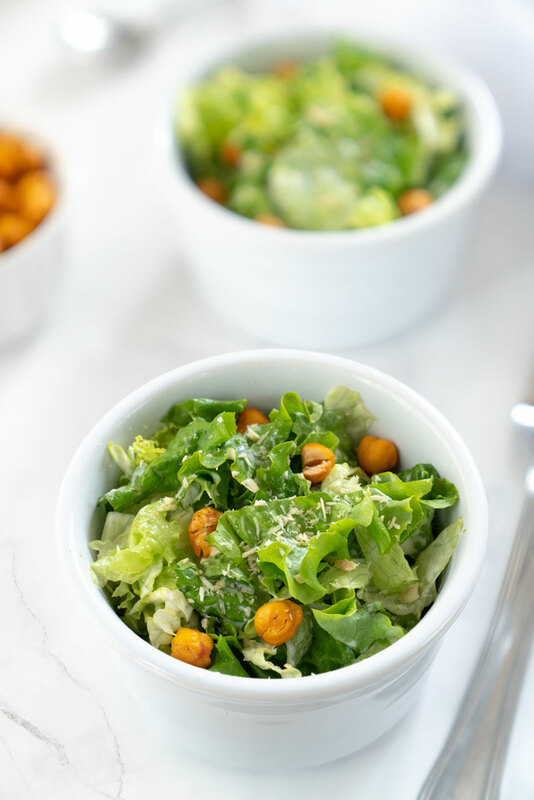 This crisp, hearty, tangy, and vegan Caesar salad is a refreshing spin on the old classic. 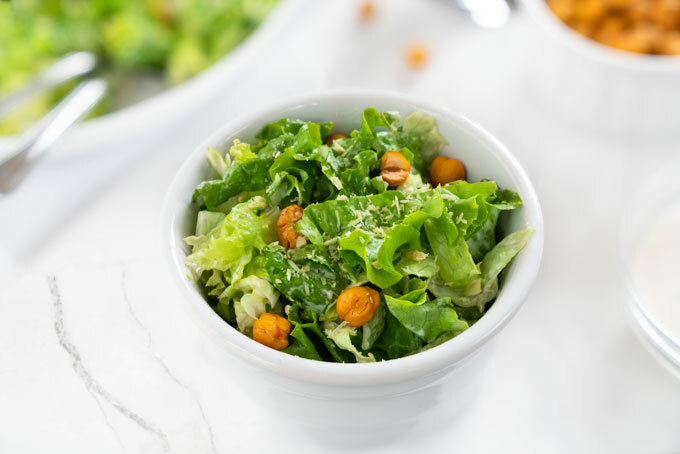 I know that Caesar salad isn’t the healthiest salad in the world, but it’s perfect for a special occasion or when you’re craving a salad with a creamy dressing. I have to admit that I’d never been a big fan of a Caesar salad. The heavy dressing, flood of Parmesan cheese, and white-bread croutons just never made me feel particularly good about eating this salad. However, my husband (Tanner) is kind of obsessed with it. Whenever we eat out and Caesar salad is on the menu, he’s ordering it. Every single time. This isn’t typical of him at all because he rarely, if ever, orders the same meal more than once. But when it comes to side dishes, it’s always Caesar salad. Since we don’t eat out that often, I never even thought about transforming Caesar salad into a healthier plant-based alternative. However, when Tanner brought a bottle of a Caesar salad dressing home a few weeks ago (just so that he could make Caesar salad more frequently), I really wanted to come up with a healthier alternative. Having Caesar salad as an occasional treat in a restaurant? OK. Turning it into a staple with a store-bought dressing? Not so OK. The good news is that it’s not that difficult to turn Caesar salad into a nutritional bomb! In fact, the first time I made this vegan Caesar salad, Tanner finished all 6 servings, aka the entire bowl! He actually thought that I used the dressing he bought for himself. So, when I told him that it’s dairy-free, his jaw dropped. Yes, this vegan Caesar salad is that close to the original. While I have nothing against romaine lettuce, when it comes to a nutritional value, it pales in comparison to other leafy greens like spinach, kale, or Swiss chard. Generally speaking, the darker the leafy green, the more nutrients it possesses. So I usually mix some de-stemmed dino kale or spinach with the romaine lettuce for added fiber and nutrients. I like the two tones of greens on the plate as well. For the dressing, I use cashews. There’s a reason cashews are labeled a culinary wonder. Cashews provide a creamy rich consistency without any diary. Capers stand in for the salty, briny flavor. Mustard adds the much needed zing, and lemon juice with olive oil balance the dressing. Tweak the garlic and salt to your taste and voila – you have a perfect Caesar salad dressing. Vegan Parmesan cheese is nothing but a mixture of coarsely ground cashews mixed together with some nutritional yeast, salt, and garlic powder. It’s savory, cheesy, and surprisingly tasty. Finally the croutons. Yes, you can use regular bread. However, if you want to get more protein out of this salad (and increase the nutritional value), swap the croutons for roasted chickpeas. These chickpea croutons are not only healthier, but also crunchy, savory, and very addictive. 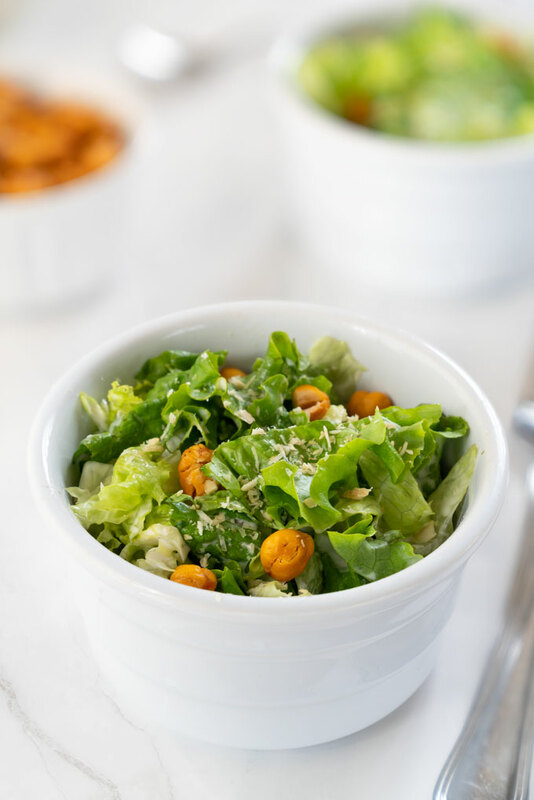 Vegan Caesar salad with creamy, briny, lemon-y, and tangy dressing, savory Parmesan "cheese", and crunchy chickpea croutons. Drain and rinse the chickpeas. Dry them thoroughly using a kitchen towel or a paper towel. Place them on a baking sheet, drizzle with olive oil, and sprinkle with salt. Using your hands, toss and coat. Roast the chickpea for 20 minutes, then gently roll them around in the baking sheet and roast for another 10-15 minutes, until golden brown. The chickpeas will firm up as they cool. Add the soaked and drained cashews, water, olive oil, lemon juice, mustard, capers, garlic powder, and salt into a high-speed blender. Blend on high until smooth. You might have to scrape down the pitcher a few times. Add the cashews, nutritional yeast, salt and garlic powder into a food processor. Pulse all the ingredients until finely chopped. It should look like a fine meal. Wash the romaine lettuce and kale thoroughly. De-stem the kale. Then chop both the kale and the romaine into desired pieces. Add the chopped romaine lettuce and kale into a large bowl. Pour in the dressing and mix until all the leafy greens are well coated. Top the salad with the chickpea croutons and vegan Parmesan cheese. Serve immediately. Store leftover salad covered in the refrigerator for a few days, though best within the first 24-48 hours. Note: the chickpea croutons do lose their crunchiness over time. *1 (15 oz/425 g) can of chickpeas equals about 1 1/2 cups (246 g) cooked chickpeas. **Soak the cashews in water for at least 8 hours (or overnight) so they soften up and are easy to blend. To quick-soak cashews, pour boiling hot water over the cashews and soak for 1 hour uncovered. When the cashews are done soaking, drain the water and rinse the cashews thoroughly. 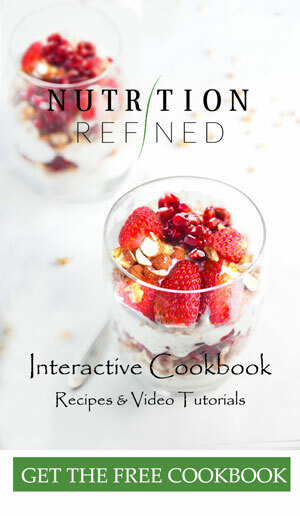 This recipe has been adapted from MyVega.